Do you know someone who LOVES the Twilight series? This shirt tells it all!!! 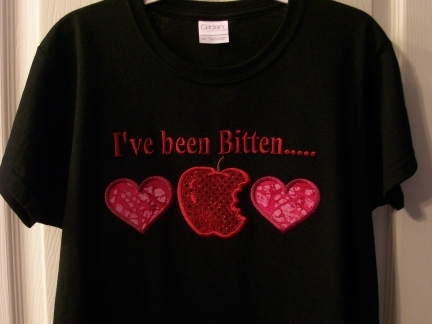 The apple will be appliqued in a beautiful red sequin fabric. Hearts will be appliqued in a coordinating fabric. Choose T-shirt, long-sleeved T-shirt, or sweatshirt, in black, white, or grey. Available sizes Youth Medium - Adult 2X.